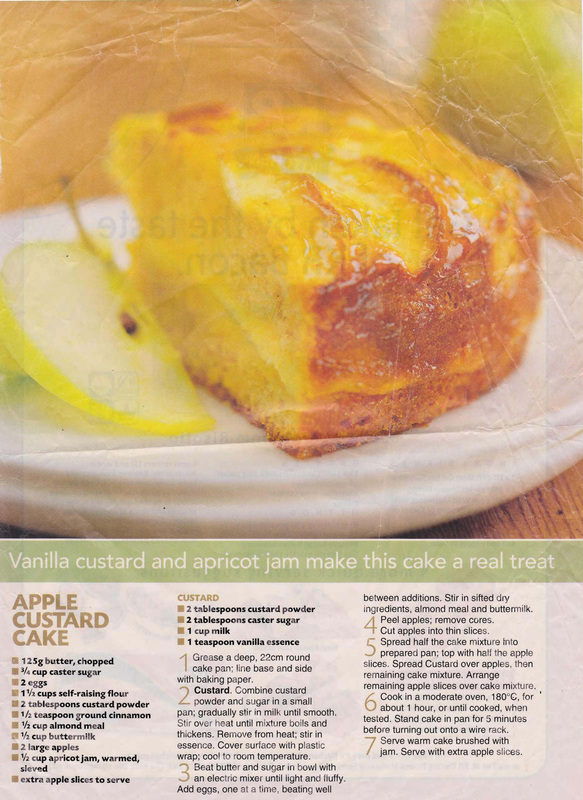 I think the words – apple, custard, cake – says it all for this recipe and when you add in apricot jam and perhaps a blob of cream, who needs more………..delicious. To be honest I don’t think this is particularly ‘tropical’, but it still sounds good. 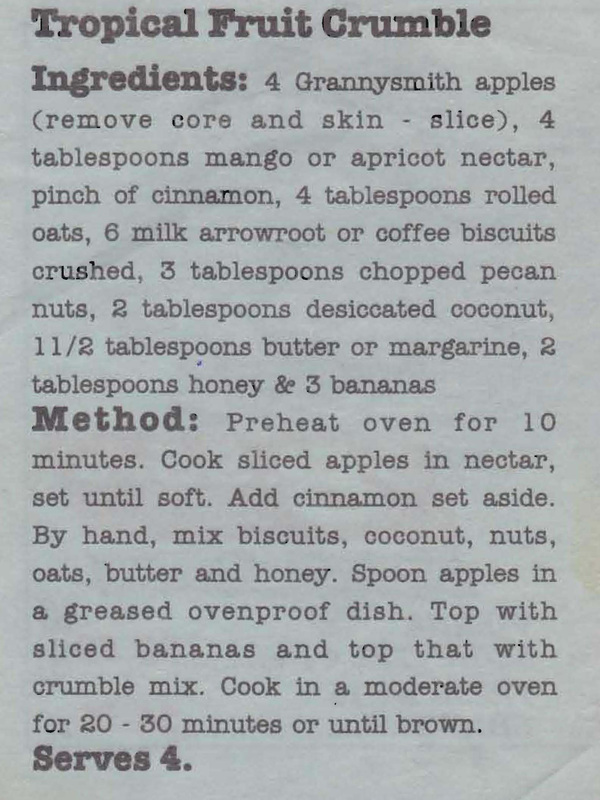 It’s really just an apple crumble with bananas, coconut and pecans – does that make it tropical, I leave it to you to decide…….. 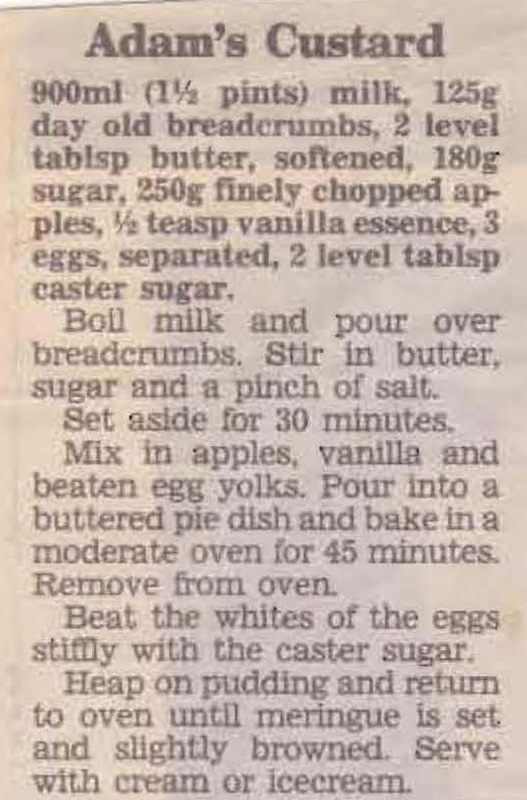 This recipe sent me off googling ‘apple brandy’ as I thought sprinkling that instead of straight brandy on to the fruit might give it an extra kick. I had Calvados in mind, but I discover there’s other apple flavoured liqueurs on the market these days, so maybe it would be worth trying one of those instead. 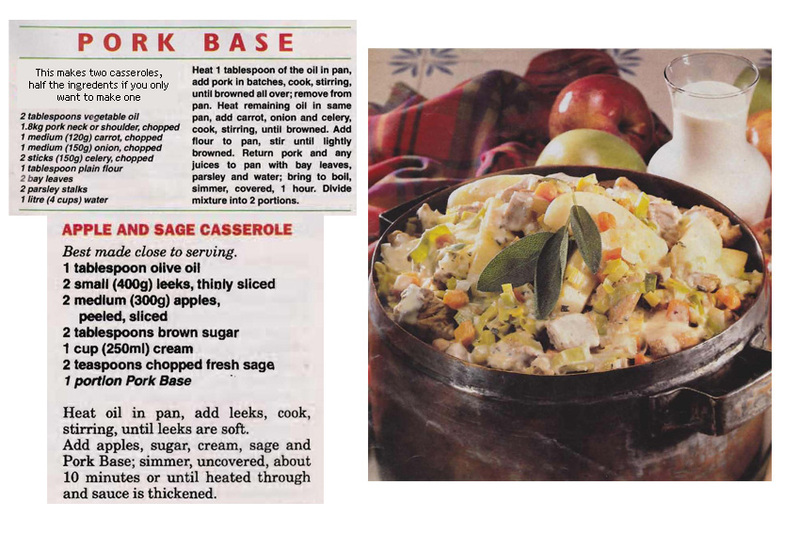 This casserole base makes two portions and is a great way to pre-prepare a couple of nights dinners. You can make the base, divide in half and then freeze it. It’s easy enough then to defrost it and add the extra ingredients on the night you want to use it. I have no idea who Adam is, so I thought I’d rename this recipe Meringue Topped Apple Custard. What I like about it is, that as with a lot of the old recipes, there’s no fancy ingredients, just things you have in the cupboard. In this case, milk, bread, butter, apples, vanilla essence, eggs and sugar so that makes it a great ‘last minute’ dessert. This recipe comes out of a Woman’s Weekly pullout called Pies without Pastry. 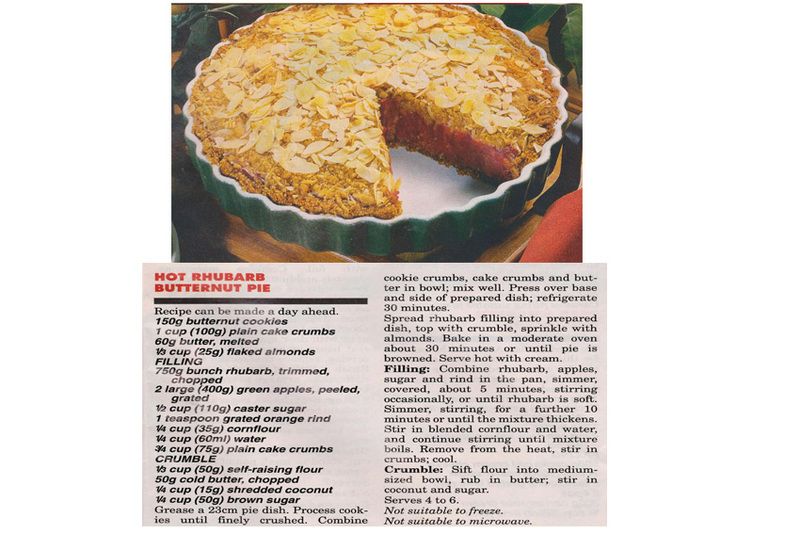 When I first saw the title I thought the filling was rhubarb and butternut pumpkin which sounded very strange. On reading the recipe I was relieved to discover the butternut was actually butternut biscuits crushed to make the base. When you top that with the filling of rhubarb and apples and the crust of coconut and brown sugar you end up with a great tasting pie. This is another version of Tomato Relish, unlike the other one I posted last year, this one has apples and sultanas added into the mix. 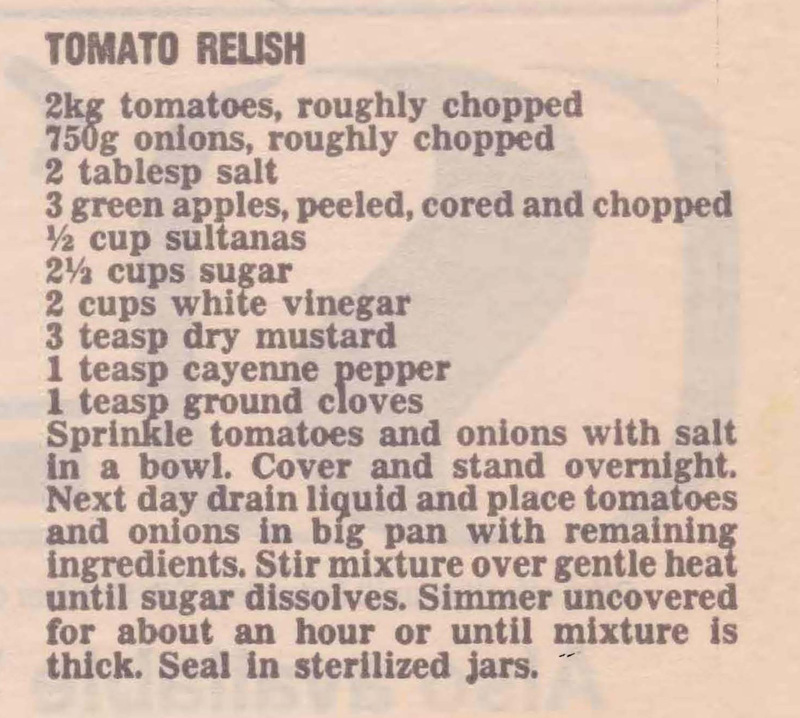 It’s still a two day job though, as you need to let the tomatoes and onions sit overnight with the salt on them, before adding the other ingredients and cooking until thick the next day.